Dogskin offers exceptional outposts located on lakes where we have the only outfitting rights, deep in the Eastern Manitoba bush. Each lake has only one cabin and you can be assured that you are only one of a handful of people that fish the lake every year. Whether you are interested in bringing up longtime friends, are part of a corporate group, or a family taking an annual fishing vacation, we are certain that we will provide you with a high-quality, stress-free fishing trip. You can choose between our three solar-powered, modern camps on Mannifrank, Noname or Black lakes, or our traditional camp on South Eagle. All of our camps are located within 30 miles of the main lodge on Dogskin Lake. Our modern camps feature solar power, hot/cold running water, showers, refrigerator/freezer, electric lights and three-season porches. Satellite phone service is also available at the modern camps. The solar systems charge large battery banks, providing uninterrupted power for our guests. The conventional camp at South Eagle has propane lights and refrigerator/freezer, hand pumped water and a three-season porch. Trips to our outposts are available in three-, four- and seven-night packages. They include all of the basics that your group needs for a successful fishing vacation, including your round trip floatplane transportation, boats, motors, gas, propane and conservation fishing licence. You only need to be bring in your fishing gear, clothing, sleeping bag, food and any personal items. In addition, we can provide high quality, customizable food packages to make it even easier to plan and execute your trip. This option has become very popular due to the large amount of space and time that it saves our guests. Over 20 years ago we instituted a "Catch and Consume" fishing policy that allows us to protect the fantastic fisheries at the outposts by keeping all of the larger fish in the lakes. We allow our guests to keep fish in the range of 14" to 17" for their shore lunches. Everything else goes back to be caught again another day. The outpost at Mannifrank was first used in 1997. It has quickly become one of most popular outposts due to its outstanding walleye fishing throughout the season and great early and late season pike. The lake contains about 1700 acres of water, with a portage lake also available for additional fishing. Mannifrank has a significant amount of open water. Guests will find a large amount of structure and cover out on the lake that holds the larger fish. The long narrow bay to the Northwest is fairly shallow and provides spectacular fishing in the early and late seasons when the water is cool. As the water warms, the fish migrate out to deeper water and can be found 20' to 30' of water or deeper. Mannifrank is a comfortable outpost camp with 3BR, shower, full kitchen and dining room. The three bedrooms allow parties of up to 8 to reside comfortably during their trip. The cabin features solar power, hot/cold running water, a shower, a full kitchen with necessary utensils and a separate building for cleaning fish and storing gear. Mannifrank has 16' Lund boats with 4-stroke, 15Hp motors. The boats are supplied with high-back swivel seats, cushions and landing nets. Noname lake has always been known for spectacular walleye and northern fishing. Located on a major river system, guests enjoy features associated with both lake and river fishing. There is a large set of rapids to the North with additional boats and motors located below for our guests to use. In the past, the fishing was great, but the cabin was just average. However, in 2005 we completed a complete renovation of the cabin, making it one of the best outpost cabins you'll find deep in the Canadian bush. Large windows in the three-season porch and a deck allow spectacular views of the pristine wilderness that this area of Canada is known for. Noname is a comfortable outpost camp with 2BR, shower, toilet, full kitchen and dining room. Noname has two bedrooms with bunks and sleeps six guests very comfortably. The cabin features solar power, hot/cold running water, a shower, indoor flush toilet, a full kitchen with necessary utensils and a separate building for cleaning fish and storing gear. Noname has 14' boats with Mercury 4-stroke, 15Hp motors. The boats are supplied with high-back swivel seats, cushions and landing nets. 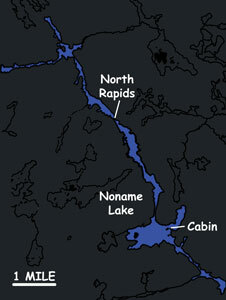 Black lake is a long, narrow body of water. It has eight miles of waterways, 1400 acres and numerous islands to keep the adventurous fisherman busy. At Black, you'll never lose a day of fishing due to winds. As with all of our lakes, fish will be found towards the shore that that a consistent wind has been blowing into. Black is a comfortable outpost camp with 3BR, shower, full kitchen and dining room. Black has 14' boats with 4-stroke, 15Hp motors. The boats are supplied with high-back swivel seats, cushions and landing nets. 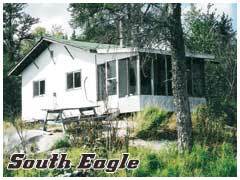 South Eagle is our conventional outpost camp. It is a headwater lake that flows North into the Bloodvein River. Fishing throughout the summer if fast and furious for walleye, northern and the abundant jumbo perch. The camp utilized LP for the stove, refrigeration and lights. South Eagle trips depart the floatplane base in Bissett, which is about two hours drive North of the floatplane base in Silver Falls, which we use for all other trips. This allows us to provide a great Canadian fishing adventure for a very reasonable price. South Eagle is a non-modern outpost camp. Its just an affordable basic camp on a great lake. There is a kitchen, refrigerator and 4 boats. With two cabins, South Eagle can occupy up to 12 guests. the 14' boats are furnished with 8Hp motors, swivel seats and landing nets. See our Frequently Asked Questions (FAQ) page for more detailed lists for your equipment, clothing, travel documents, etc. Rates do not include applicable provincial and federal taxes. Charges for weights above the allowed 100 lbs per guest are a mandatory $1 per pound. Trip availability is limited for small groups of less than four guests. There is a minimum charge of 4 guests for any trips that take place in June. There is a small group surcharge of $600/group for trips at other times of the year. We accept personal checks for the deposit and advance payments. We can also take credit cards for deposit and/or final payment, but we pass on the 3% fee that our payment processor charges us.